Schutt Adult Vengeance Football HelmetSchutt isn’t a company that rests on its laurels. That’s why they took one of the most popular helmets in the game today and made it even better with the Schutt Adult Vengeance Football Helmet. While the helmet maintains its distinctive look with a high-powered shell design, it now includes new Single Layer DCT TPU that makes the helmet lighter and absorbs impact better than regular TPU. The upgraded TPU still absorbs both high velocity hits and low impact blows that occur during games. But it also drops the weight of the Vengeance down to 2.85 pounds, almost a full pound lighter than the previous model. The 2014 edition still features everything else you’ve grown to love about the Vengeance, including a SUREFIT TPU AiR liner that gives the helmet unmatched comfort and feel. It also includes a patented twist-release system that makes attaching facemasks (not included) easier than ever. The Vengeance still meets NOCSAE standards and comes with a soft cup chin strap and 7/8″ AiR Maxx TPU jaw pads. For more details on the Virginia Tech Helmet Ratings and the STAR evaluation system, click here. 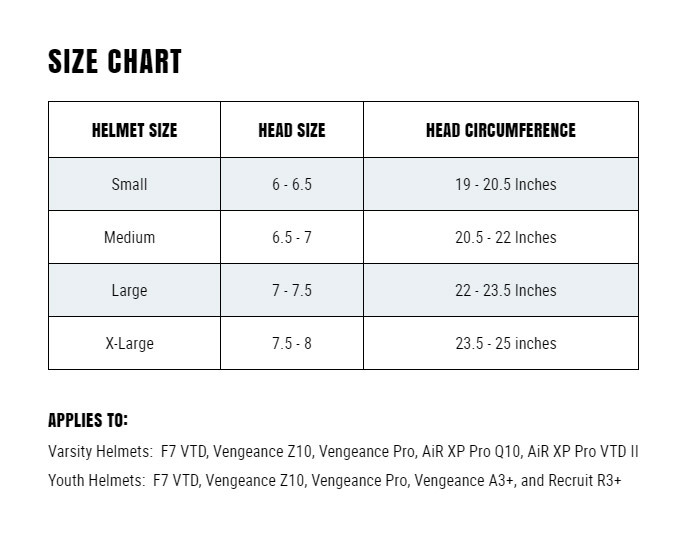 This Chart will assist in finding a helmet with the proper size. These sizes are an approximation as some brands may differ slightly because of materials and design.